Since joining the Cheesepalooza Challenge in September I have managed to create at least one of the cheeses each month except for February where I missed the gouda challenge. I have also created a number of extra cheese or cultured dairy products as well. I have managed to write about most of them but have missed a few Cheesepalooza deadlines to be included in the challenge but if you are interested they are all located here in my blog. It has been 3 MONTHS since I have had an opportunity to make cheese; family life and work have kept me exceptionally busy this year volunteering for my kid’s clubs and teams doing everything from writing newsletters, timing at ski races, brainstorming on band names and band logos and chauffeuring literally thousands of kilometers to name a few. These cheeses are some of my favourites. On our first trip to Europe about 25 years ago (a driving – camping – live on $55 a day type trip) we were passing from France into Switzerland south of Geneva and stopped in one of the last French villages to load up on food as we had been warned of the high prices in Switzerland and besides, we had fallen in love with grocery shopping in France (a love that persists to this day and that has now been passed on to our kids) so we stopped. I could paint a picture of a quaint little fromagerie in the Alps….blah blah blah but we are actually talking chain supermarket with hopefully lower prices (remember $55 a day including food). We walk into the shop and begin collecting our usual selection of saucisson sec, wine, bottled water, bread and more but where is the fromage? A quick question in broken French and a gesture to a back room leads us to an amazing sight a room with six or seven stout tables each covered in a variety of cheese wheels, some of them were huge – 3 foot diameter and 8 to 10 inches thick. We make our selection and get the attention of the cheese lady. She sets her huge knife on the wheel and is about to cut a wedge from a 2 and a half foot wheel about 4 inches thick; a quick NON! and some pantomime and we get a sliver of cheese weighing about a pound. Gigantic wheels mean gigantic wedges! That was a close one we almost spent our daily living expense on one piece of cheese. The cheeses we bought that day were delectable and kept us well nourished on our trip through Switzerland. 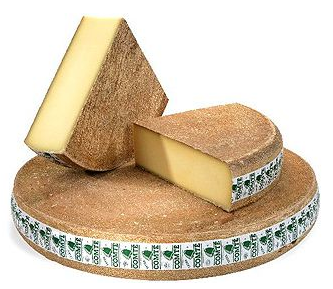 Gruyère is a hard yellow cheese, named after the town of Gruyères in Switzerland, and originated in the cantons of Fribourg, Vaud, Neuchâtel, Jura, and Berne. 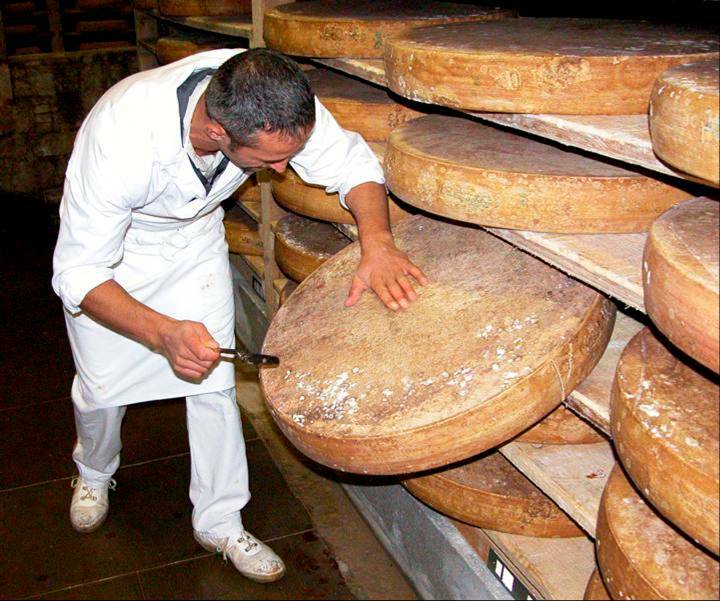 Before 2001, when Gruyère gained Appellation d’Origine Contrôlée (AOC) status as a Swiss cheese, some controversy existed whether French cheeses of a similar nature could also be labeled Gruyère (French Gruyère style cheeses include Comté and Beaufort). 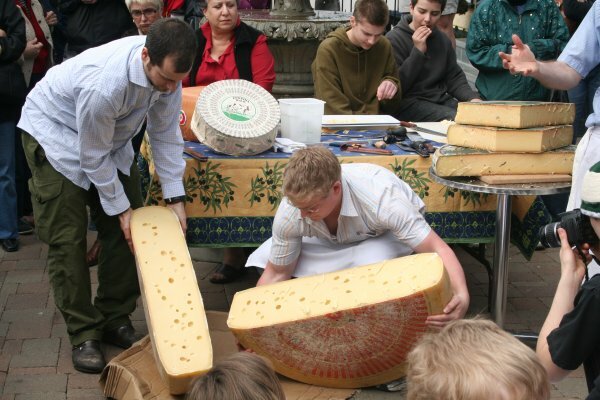 Swiss varieties with eyes include distinctive types most commonly represented by Emmental, with very large eyes and huge wheels weighing about 220 pounds; and the Gruyère group which includes Beaufort, Comté and Gruyère, with smaller wheels weighing closer to a mere 88 pounds and smaller eyes. These cheeses are not only distinctive because of their appealing eye formations but also their springy texture and sweet nutty flavour. These cheeses are traditionally made using raw milk. It takes a real Cheeseman to work with this stuff! Now on to the cheese make. I decided to follow Gianaclis Caldwell’s recipe for Hard Cheese with Small Eyes. A cheese making book my wife gave me for Christmas. 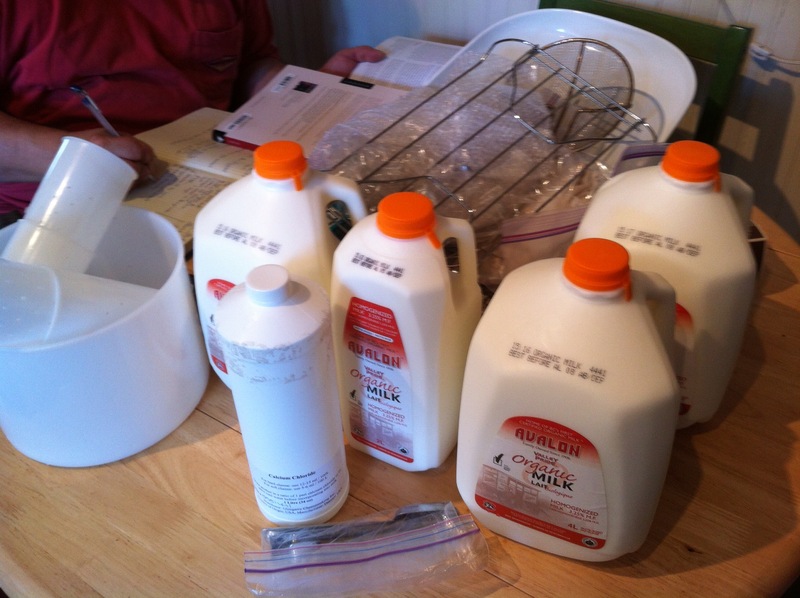 The recipe calls for 4 gal of whole or partly skim milk. My ‘cheese roaster’ only holds 3.7 US gallons so I will get a slightly lower yield. 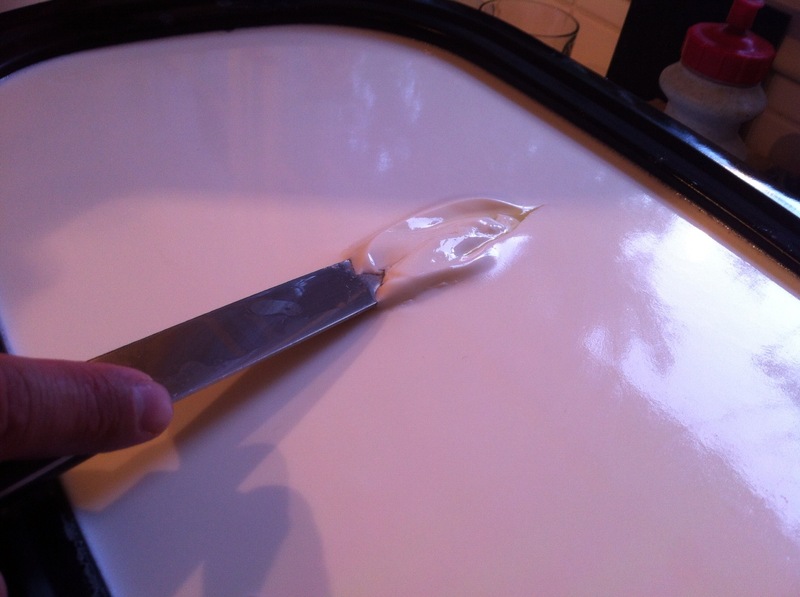 I plan on using my St. Paulin/Tome 200 mm x 150 mm mold. The first step is to heat the milk to 90 degF and sprinkle the cultures over the top allowing 5 minutes for them to rehydrate before gently stirring them in. The recipe calls for Thermo B and LH 100 or Thermo C. I used Thermo B and Thermo C.
It took awhile to get the milk up to temperature but I think I finally have the temperature control completely figured out and got the temperature perfectly to 90 degF. Next you add in the calcium chloride followed by the rennet. Hold the temperature until you get a clean beak about 25 to 35 minutes. I got a clean break at 30 minutes. 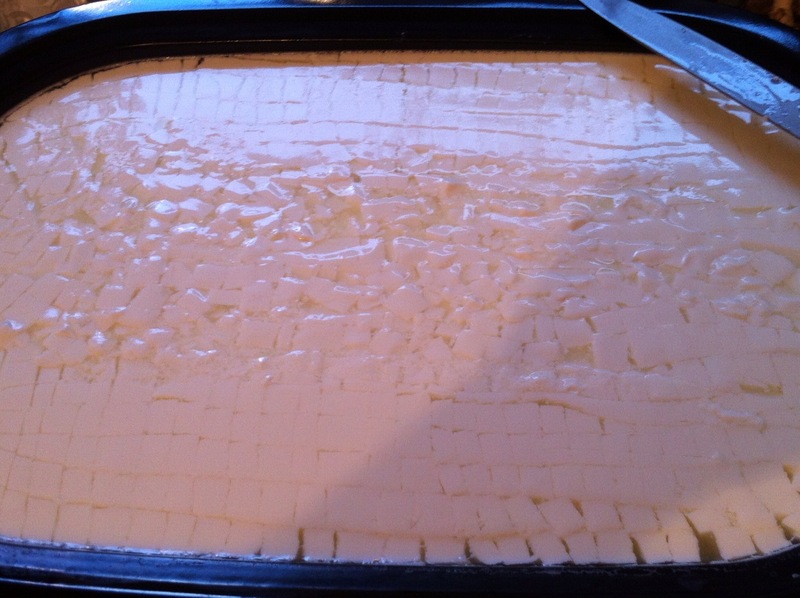 Next cut the curd into 1/4″ cubes and rest for 5 minutes. After the 5 minutes has elapsed, cut the curd into 1/8 inch cubes over the course of 5 more minutes. Next stir and heat the curd to about 118 degF over the course of an hour. The goal is to get the pH down to about 6.35. Once the pH and temperature have been attained, allow the curd to settle for 5 minutes. Now drain the whey to the curd level and try to press the curds into one mass. I didn’t have much luck with this so I scooped out handfuls squeezing them together and placing them in the cheese cloth lined hoop. Next press with the weight of the curd for 30 minutes. Turn and press for an hour with double the weight. If the curds have not fully knit together, turn and press for another 4 to 6 hours until the final pH is 5.3 to 5.4. I checked the pH at bedtime and it was 5.79. 7 hours later I placed the cheese into the brine but forgot to check the final pH. 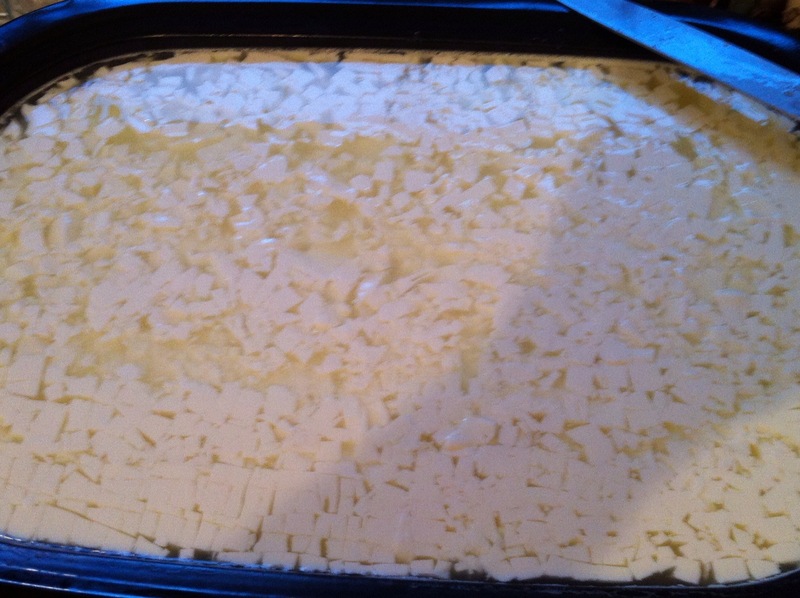 I used a heavy brine, submerging the cheese into the brine and sprinkling the top with salt. I left the cheese in the brine for 9.5 hours. The recipe called for brining 3 to 4 hours per pound. My cheese weighed about 4 pounds so it should have been brined for 12 to 16 hours but we were running late to go to my folks for what was left of Easter Weekend. I dried the cheese and placed it in my “cheese cave” at 10 degC and we hit the road for Camrose. The cheese should be turned daily for 3 weeks and kept at 85% RH. Next age for 2 to 3 months at 15 to 18 degC and relative humidity of 90%. Next age for 2 to 3 months at 13 degC and an RH of 85 to 95%. So keep an eye on my blog and I will try to post regular ‘baby’ pictures of my ‘babies’ as they develop. 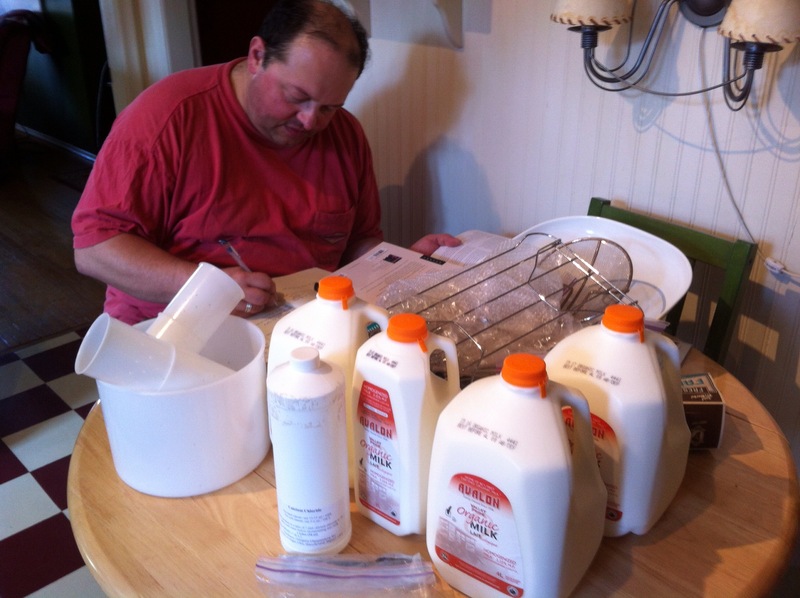 Keep an eye on my blog for reviews and updates of my flurry of December cheese making activities. If you enjoy reading my posts and trying some of the recipes, please share my blog with your friends and acquaintances. When I started writing this blog it was at the urging of Val (A Canadian Foodie) to share some of the things I was up to. I didn’t expect this but I really enjoy looking at the stats for my blog and seeing all the different countries (locations) of the folks that read my blog. To date I have had visitors from 30 different countries and over 600 views of my posts. It is great to see food & cheese lovers connecting on such a global scale. Nice looking cheese. Are you using a pH meter or strips? Also with your roaster are you using the insert or are you straight in the bottom? Thanks Ian, I am using the insert with water bath and my new pH meter. Have you went straight on the bottom? I would definitely like more milk volume! I want to try, but kind of chicken incase I ruin the vat. I’m at the same place. But I did buy my vat on Craig’s List for $30 so I shouldn’t be so worried. I might try heating water first to see how it behaves. Does Val use her liner? I want to know those answers to Ian’s questions, too. Loved the detail in the post, Rick! Cannot wait to taste it – eventually. I am surprised it didn’t knit together better…. that is a bit odd. 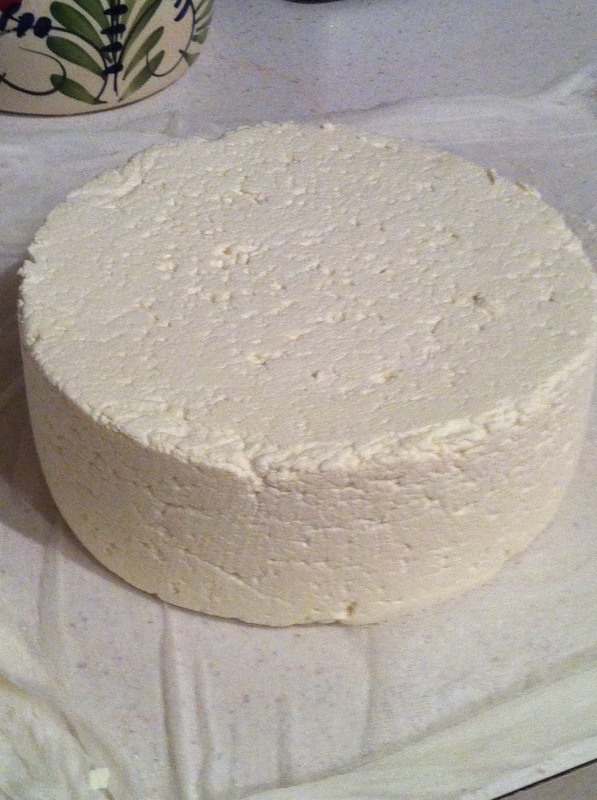 Usually after the 30 minute first press, the curd looks like this, not after the final press. Val, the photo was actually the first 30 minute press with light weight. I didn’t get a picture of the final press, it was sealed almost completely. I started about 3 pm and didn’t finish until 2 am. I had great temperature control but took way too much time to get to the first temperature (a couple hours) as I didn’t want to overshoot. Always learning something new! Sailor Rick, GREAT!!!! I am glad to read that your curds knitted together….I wondered how you could age it with the curds not knitted together! Thanks Dianne, comments like yours keep me going. Yes the curds knit together well and the cheese is aging nicely. Would have been interesting, not sure what that would have turned out like without a strong knit. BTW, hopefully my post on Brie making will be out in a week or so. Thanks again for reading and your comments.